The Publication Overview Application gives you a general overview of how far the production process of a publication has progressed by showing all layouts of a publication and the Workflow Status of these layouts as well as the Workflow Status of the objects placed on the layout. This way, you can quickly see which areas of the publication are (nearly) completed and which areas still need work. Information about total pages, created pages, duplicate pages and missing pages is also provided. Leaving comments can be done by placing Sticky Notes. 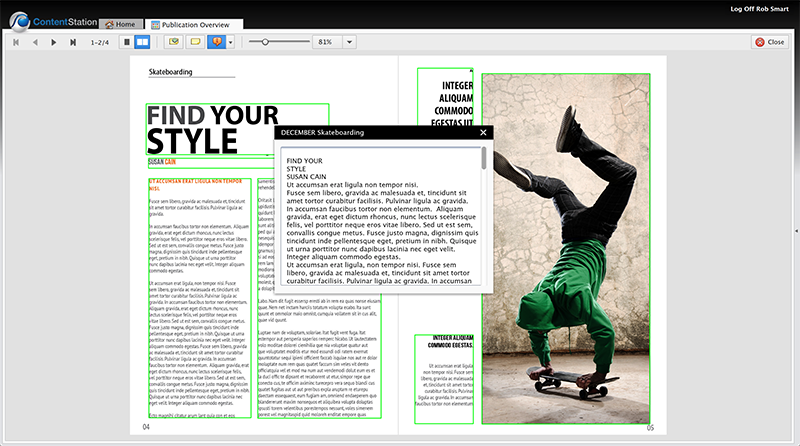 The Full Layout View, showing a full page or spread at a time. It allows you to perform actions such as placing Sticky Notes, opening placed files for editing and so on. Figure: The Publication Overview gives you a complete overview of the publication. Right-click a layout, image or article and choose Open in Publication Overview. (Requires Content Station 9.4.3 or higher). On the Home page, double-click Publication Overview in the Applications pane. From the Content Station menu, choose Tabs > Publication Overview. When accessing the Publication Overview Application, the Publication Overview page is displayed. It shows all pages of the publication. Use the Filter at the top of the page to locate the publication that you want to view. Make a choice from one or more lists and click the Search button. Note: When choosing an Issue from the Issue list, a new search is automatically performed (requires Content Station 9.8.12 or higher). Page previews can be shown or hidden by clicking the Page Preview icon in the toolbar. The Workflow Status of a placed object can be shown or hidden by using the Status Info icon in the toolbar. When enabled, a placed object is displayed in the color of its Workflow Status. In Content Station 9.5.1 and higher you can show the Workflow Status colors for only articles, images and/or spreadsheets by choosing that file type from the button list. In Content Station 9.8.12 and higher the Workflow Status colors for adverts can also be shown. 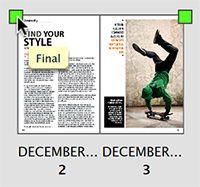 Figure: Top: displaying the Workflow Status for images and articles, middle: for articles only, bottom: for images only. The color of the layout’s Workflow Status is indicated by a square in the top corner. The position of the square indicates the position of the page: left for left-handed pages, right for right-handed pages. Hover the mouse pointer over a square to view the name of the Workflow Status. A Workflow Status can be configured in such a way that when a layout reaches that status, a PDF is automatically generated. 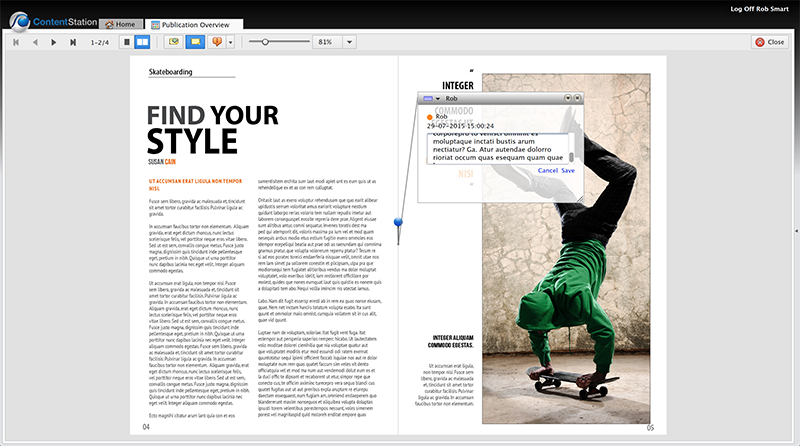 When such a PDF is available for a layout, a PDF icon is displayed below the layout. Click it to download the PDF. 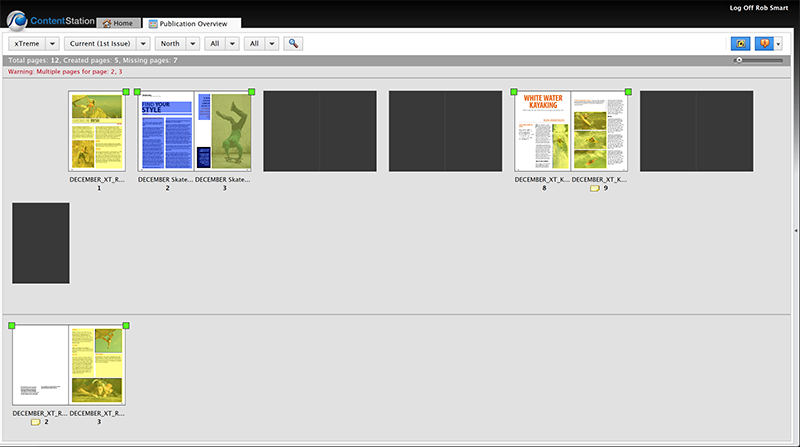 To quickly open a Dossier to which a layout belongs, Alt+double-click a layout (requires Content Station 9.8.12 or higher). The alternative method is to right-click a layout and choose 'Open Dossier' from the context menu. Sticky Notes can be used for leaving short messages to other users — including InDesign and InCopy users — for instance to indicate any changes or corrections that need to be made to the content of a page. For more information, see Working with Sticky Notes in the Publication Overview Application of Content Station 9. When a Sticky Note is added to a layout, a Sticky Note icon is displayed below the preview (requires Content Station 9.5.1 or higher). This icon is always yellow but changes to green when all Sticky Notes on the layout have reached the status of 'Done' (requires Content Station 9.8.12 or higher). This allows you to quickly see which pages still have Sticky Notes that need to be addressed. Figure: Sticky Note icons are always yellow but change to green when all Sticky Notes on the layout have reached the status of 'Done'. The Publication Overview Application also provides information about pages that are missing or pages that have duplicate page numbering. Duplicate page numbers: When pages exist with a duplicate page number, a message is displayed at the top of the page indicating which page numbers are affected. The pages with the duplicate page numbers are displayed after the main sequence of pages. Figure: When pages exist with identical numbering, a warning is displayed (A) and the duplicate pages are placed after the main sequence of pages (B). Missing pages: By default, pages that are missing are displayed as gray place holders. The total number of missing pages is displayed in the status bar at the top (requires Content Station 9.5.1 or higher). Page numbers below the previews for missing pages are displayed in Content Station 9.8.12 or higher. 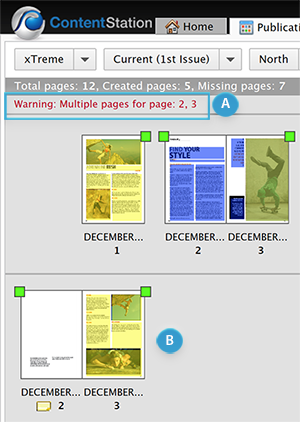 Figure: When pages are missing a warning is displayed (A). Placeholders (B) are used to represent these pages in the publication. When the option "Reading Order Reversed" is enabled on the Brand Maintenance page in Enterprise Server, spreads are displayed in reverse order and from right-to-left. Standard reading order: 1, 2-3, 4, and so on. Reversed reading order: 4, 3-2, 1, and so on. When a modified layout is saved into Enterprise by another user or when a Sticky Note is changed, this change is not immediately displayed on the Publication Overview page. To inform you that an update is available, a message is shown to the right of the search tools. To update the Publication Overview page, click the Search button. The Full Layout view allows you to view the content of the page in more detail and perform actions such as placing Sticky Notes, opening layouts or articles for editing and so on. Double-click a page preview to open a full page or spread in the Full Layout view. Many of the tools that are found on this page are self explanatory or identical to those on the Publication Overview page, but the features listed below are worth mentioning. For a placed file: hover the mouse pointer over a placed image, article or Excel spreadsheet (requires Content Station 9.5.1 or higher). A layout or placed file can be opened for editing in InDesign by right-clicking the layout and choosing Open from the context menu. Note: For this to work, Content Station needs to be properly configured. For details, see Configuring the opening of files outside of Content Station 9. Double-click a placed article to load the plain content of that article in a pop-up window. This way it can be copied to the clipboard for use elsewhere. Figure: Double-clicking an article will show the content of that article in a pop-up window from where it can be copied for use elsewhere. When the layout that you are viewing is saved by another user into Enterprise or when a Sticky Note that is placed on the layout is changed, this change is not immediately displayed in the Full Layout view. To inform you that an update is available, a message is shown below the controls. To update the layout, close the Full Layout view and open it again. 4 September 2017: Added section 'Using the Filter'. 4 September 2017: Added section 'Quickly opening a Dossier'. 4 September 2017: Updated 'Missing pages' with info that page numbers are available since Content Station 9.8.12. 4 September 2017: Added that the Workflow Status colors for adverts can be shown since Content Station 9.8.12.